Despite every car ever built having all of ‘em, amongst the most complex of things to understand in a car are the angles built into the front suspension and steering. Even their names are bewildering: steering axis inclination, camber, castor, scrub radius, toe, Ackerman... So let’s take a beginners’ look at what all of these mean. In Part 2 we’ll look at the implications of these angles for how the car feels and corners on the road. 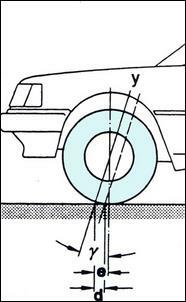 Camber is the angle that the wheel leans away from vertical when the car is viewed front-on. If the top of the wheels lean inwards towards the centreline of the car, the wheels are said to have negative camber. If the top of the wheels lean outwards, the camber is said to be positive. In the past, cars were built to have a little positive front camber but these days, the camber is either set at zero or a little negative. Camber is measured as an angle expressed in degrees and is not usually adjustable without adding a suspension kit. 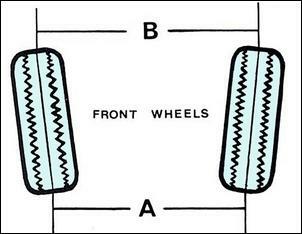 Toe refers to how parallel the wheels are when viewed from above. If the leading edges of the tyres are closer together than the trailing edges, the car is said to have toe-in. If the leading edges of the tyres are further apart than the trailing edges, the car has toe-out. With toe-in present, each wheel is steering a little towards the centreline of the car. Toe can be expressed either as an angle in degrees (better) or as the difference in the distance between the front and rear edges of the tyres (not so good but more common). The reason that the latter measurement style isn’t so good is that even if the distance measurement is the same between different cars, the actual angle of the toe will be affected by the diameter of the wheels. Toe used to be commonly set to having a little toe-in but the factory spec of many cars today is zero toe. Toe is adjustable in all cars. Castor refers to the angle of the steering axis away from vertical when the car is viewed from the side. To understand castor it is necessary to realise that all car steering systems have two pivot points on each side to allow the wheels to be steered. For example, in a wishbone suspension system, there are upper and lower ball-joints. The line passing through these swivel points is the steering axis. In a McPherson strut system, the steering axis passes through the top of the strut (where there’s a bearing or bush) and then through the lower ball-joint. The steering axis is therefore very much along the line of the strut. 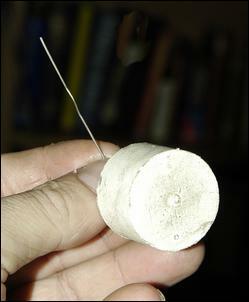 Cars use positive castor. That is, when viewed from the side, the steering axis is further forward at the bottom than the top. The affect of this is that when the steering axis is extended right down to the road, it touches the road ahead of the contact patch of the tyre. In other words, the contact patch of the tyre is behind the steering axis. When it’s expressed like this, it’s easy to see that the term has the same meaning as when applied to castors on a supermarket trolley – in both cases, the contact patch of the wheel is behind the steering axis. In a car, that axis is imaginary immediately ahead of the wheel, whereas with a supermarket trolley the swivel can actually be seen ahead of the wheel. 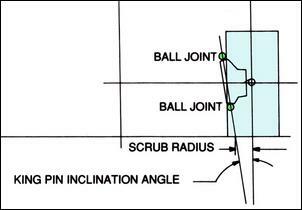 To achieve positive castor, the lower suspension ball-joint must be physically ahead of the upper swivel point. Castor is an angle so is measured in degrees. Castor is not usually adjustable without adding a suspension kit. 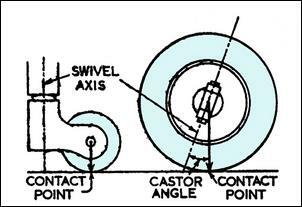 The distance between the point that the extended steering axis line touches the road and the centre of the contact patch is called the castor trail. 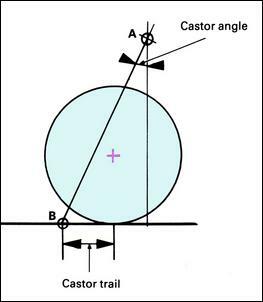 If the axle is located on the line that extends from the top ball-joint through the bottom ball-joint (ie the steering axis), the castor trail will be determined solely by the castor angle. However, there’s nothing to stop the axle being placed ahead of this axis (which will decrease castor trail) or behind this axis (which will increase castor trail). Castor trail is a distance measurement. In this diagram the line A – B is the steering axis. Note how the centre of the wheel (ie the axle, shown in purple) has been placed behind the steering axis, so increasing castor trail. Castor and castor trail are most easily seen on bicycle front forks. Straight forks that extend forwards at an angle and have the axle mounted in line with the forks have no additional castor trail – all the castor trail is provided by the forks’ castor angle. However, if the forks are curved forwards (or the axle is offset forwards in one step at the base of the forks), the castor trail is reduced. 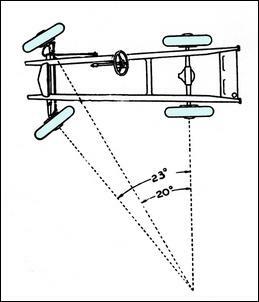 Steering axis inclination – previously called kingpin inclination as it is in this diagram – refers to the angle of the steering axis when viewed from the front of the vehicle. (So, to be clear: castor is the steering axis angle when viewed from the side; steering axis inclination is the steering axis angle when viewed from the front.) As with castor, what’s important is where the imaginary line through the steering pivot points reaches the road. If this line touches the road halfway across the width of the tyre contact patch, the steering is said to have zero scrub radius. (Sometimes this is called ‘centrepoint steering’.) If the steering axis inclination line touches the road on the inside of the tyre’s centreline (ie closer towards the centreline of the car), the steering is said to have positive scrub radius. If the steering axis touches the road on the outside of the tyre’s centreline, the steering has negative scrub radius. 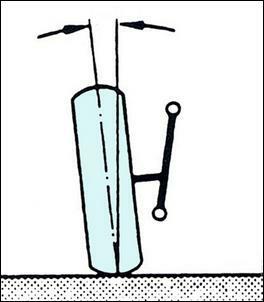 Steering axis inclination can only be achieved by placing the lower ball-joint further outboard than the upper ball-joint. 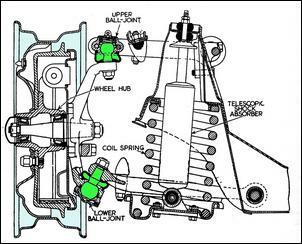 (This diagram of old Jaguar suspension shows just that.) Therefore, to achieve steering axis inclination and castor, the upper ball joint must be further rearwards and inwards than the lower ball-joint. Steering axis inclination is an angle, so is measured in degrees. It is usually not adjustable. However, scrub radius can be altered by changing the wheel offset - and so where the centre of the tyre’s contact patch is relative to the steering axis. When a car turns a corner, the inner wheel needs to turn at a tighter angle than the outer wheel. Well, it doesn’t have to, but if it doesn’t then bad tyre scrub will occur. The difference in the two wheel angles achieved during cornering is called the Ackermann angle. Ackermann is usually achieved by angling the steering arms. The extension of these angles meet somewhere along the centreline of the car. The point at which they meet was traditionally at the rear axle line, however in practice, this point can be quite a lot further forwards. Note that Ackerman steering geometry can also be achieved without angling the arms in this way. I for one have taken years to even remember what all the terms mean. But one easy way of getting it all clear in you mind is to make a simple model. 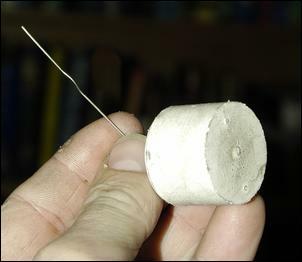 Get a paper clip and a round piece of rubber. Straighten the paper clip out until it is in an ‘L’ shape. Push the rubber onto the short arm of the ‘L’ – that’s your wheel/tyre on the stub axle. Hold the assembly vertical and turn the ‘wheel’. 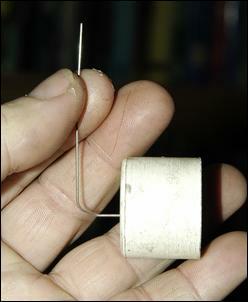 Then rotate the paper clip’s vertical – that’s the steering axis. So you can now rotate the wheel on its axle and steer it. Note that at this stage, you have zero camber, castor and steering axis inclination. 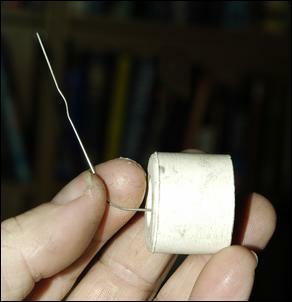 Bend the vertical of the paper clip backwards so that the angle between the steering axis and the ‘stub axle’ is no longer 90 degrees. Lean the steering axis towards the centreline of the car. You now have steering axis inclination. Bend the paper clip further to give the wheel negative camber. Watch closely and see how an increasing steering axis inclination – especially when mixed with lots of castor - gives some very weird wheel angles when the wheel is steered. People will think you mad steering a paper clip and a round piece of rubber around in the air but it is a brilliant way of seeing how the angles interact – as well as getting the definitions of the terms much clearer in your head.